Hartsville, S.C. – August 17, 2018 – Coker College’s Wiggins School of Education awarded its fifth annual Educator of the Year award to Stephanie Rogers, Assistant Principal at Cheraw Intermediate School in Chesterfield, South Carolina. The Educator of the Year award is granted annually to a teacher who has served as a positive mentor for Coker education students, offering encouragement and support above and beyond expectation. Rogers provided opportunities for field experiences and served as a supervising teacher during her time at Cheraw Primary School for multiple Coker students. Teacher candidates have consistently given positive feedback regarding her mentorship. The faculty and staff of the Wiggins School of Education presented the award to Rogers at a dinner honoring supervising teachers. For more information about the Wiggins School of Education, as well as Coker College’s undergraduate and graduate programs in education, please visit www.coker.edu. 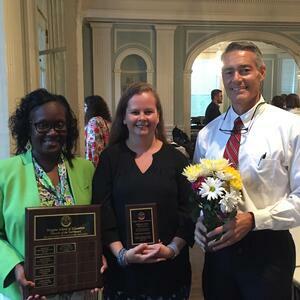 Photo (L-R): Melisa Little, Principal of Cheraw Primary School; Stephanie Rogers, Wiggins School of Education's 2018 Educator of the Year and Assistant Principal of Cheraw Intermediate School; and Scott Eddins, Principal of Cheraw Intermediate School.